In its first few hours, the Japan quake Person Finder had logged more than 4,000 records. The extent of the damage caused by the Japanese earthquake is not yet known but its magnitude and the widespread devastation wrought by the subsequent tsunami is likely to see tens of thousands displaced. The Person Finder was developed to solve a problem common in the aftermath of many catastrophes when many different agencies are on the ground giving aid and gathering information about victims. 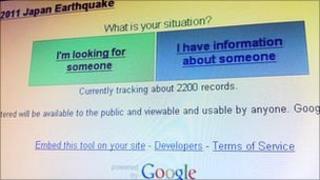 Image caption Google's Person finder was used in the aftermath of the 2011 New Zealand earthquake. Before the advent of tools such as Person Finder it was much harder to compare the information gathered by separate agencies and help to re-unite families and friends. Underlying the site is a common format for describing people who are lost or who want to announce they are safe by whatever means they can. In the wake of disasters, many volunteers in other countries often scrape sites for this formatted information and add it to the People Finder database. Others take information from blogs, texts and tweets and convert it to the format so it can be put in the database. The system was first used following the Haiti earthquake that struck in January 2010. That first tool was based around work done in the aftermath of Hurricane Katrina that hit New Orleans.